A while ago I received a vox box from Influenster with a couple of products in it. 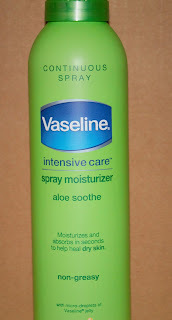 I have finally gotten around to using the Vaseline lotion. Here's a side note: I have very dry skin. The only lotion I use is either St Ives Oatmeal and Shea Butter or the Vaseline Cocoa Butter. What I like about the product is that you can control how much you are using of it. I know sometimes with regular lotion I may pump too much. Usually, I end up with WAY too much lotion on the area that I am putting it on. Now to what I didn't like about the lotion. I had to reapply it a few times in certain areas. 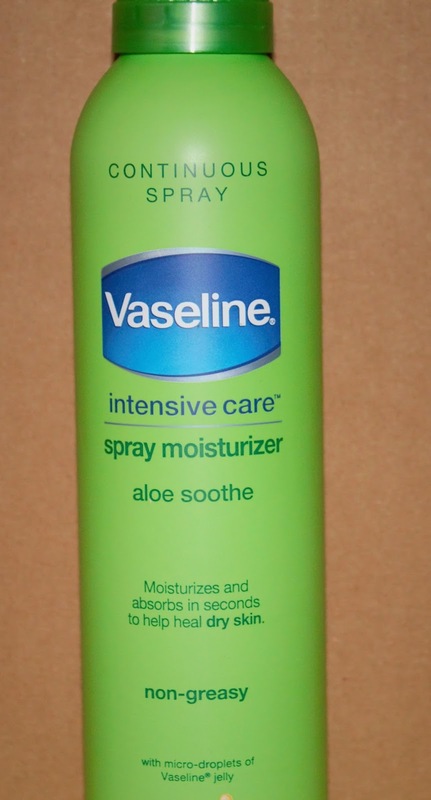 Usually with lotion I use I put it on once and it keep it moisturized for the whole day. I only had to spray once on my arms but had to go back and spray three times on my legs. Also, when you rub it in, the lotion has a weird texture to it. It maybe because of my skin issues that it felt that way but it was definitely not greasy feeling. Overall, I like the concept of the product: easy to transport with you places in a tote bag, great for trips and travel, and no worrying about a potential spilling incident. This product was provided to me for testing purposes. The opinion shared here are my own.